We cross the border of one more state. Attention, it’s another time zone – in this journey the fifth one for us..! We are exactly in the middle of the Road. The notice in Adrian TX says that we have already driven 1139 miles and just the same distance is still ahead of us. The point is contractual but emotions are great! 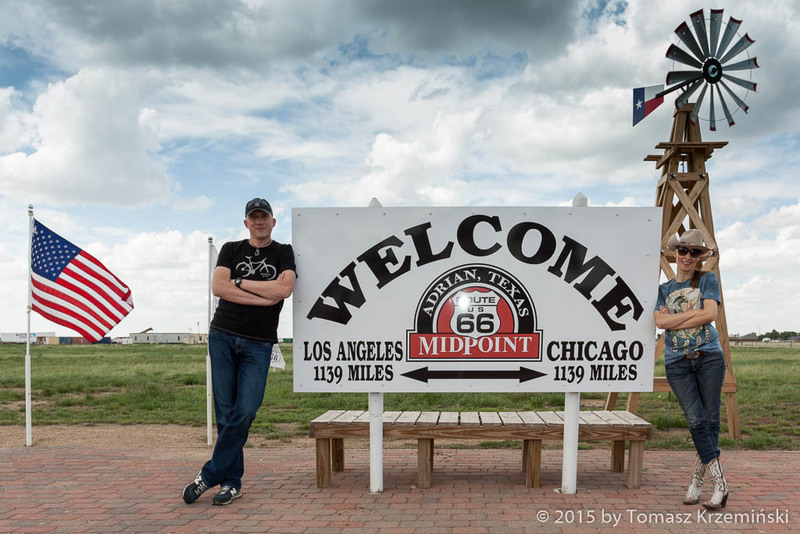 MidPoint Cafe and Gift Shop in the middle of Route 66. Only here you can eat delicious “Midpoint Ugly Pie” which means the pie with a rough edge. The new owners (for 3 years in Adrian) wanted to buy a cafe for a long time. They were looking for a quiet place. Driving through Adrian once, heading to LA in business, they dropped in just before closing time. In 10 minutes time they found out that the then owner Fran Houser wants to sell MidPoint Cafe and they are interested in buying it. Few months later the Cafe was theirs. 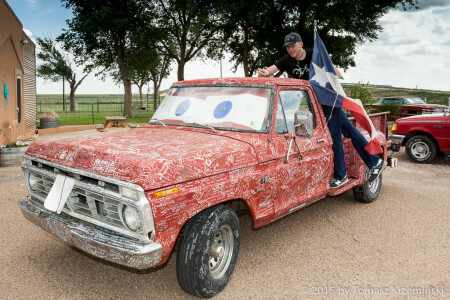 It’s incredible what the Americans can do to make their dreams come true. 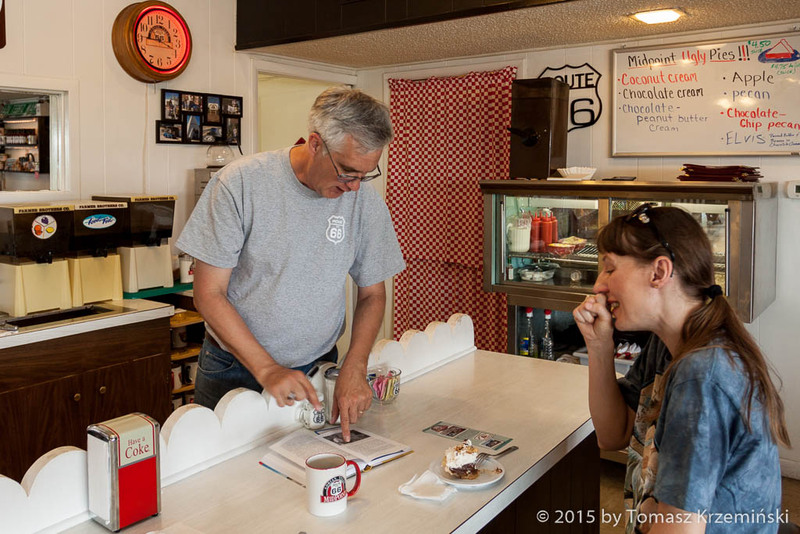 Dennis moved here from Tennessee – it’s 1000 miles away from here(! ), that’s 1600 km. He leaves in mobile home, which means a house on wheels, standing at the back of a Cafe. Every couple weeks Donna who is the wife of Dennis, comes here to support her husband. 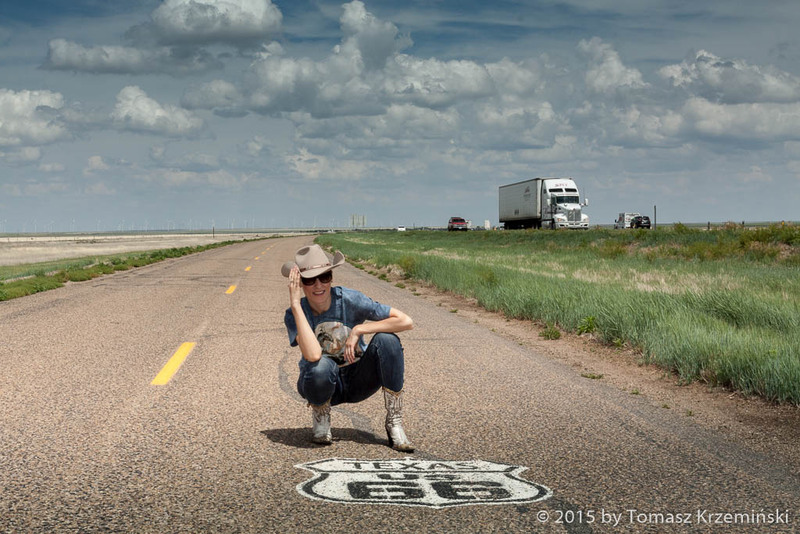 Then they go home to Tennessee 1000 miles by car, Donna stays there and Dennis comes back to Adrian, once more this 1000 miles... How much addictive is this Route 66 to live like this...? 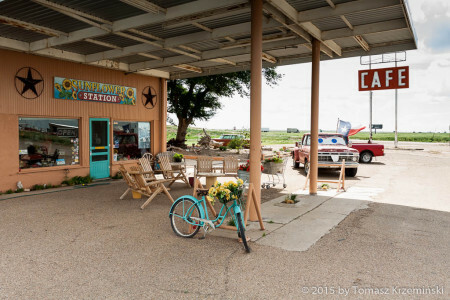 Sunflower Station is a gallery, next to MidPoint Cafe, with antiques and souvenirs in Western style. It is run by warm and charming Fran Houser, former owner of MidPoint Cafe. The woman who was used to comfort and wealthy lifestyle on the Eastern Coast, with cook and cleaning lady at the house. She used to wear silk blouses and high-heeled shoes. 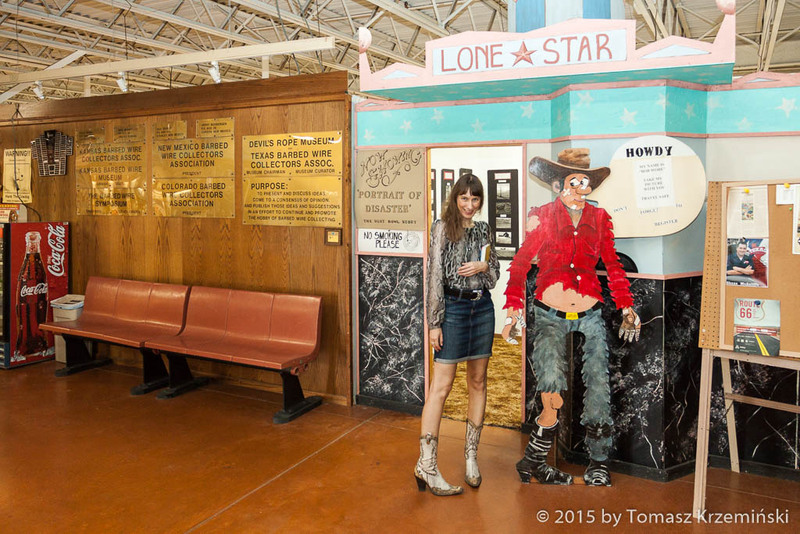 She came to Texas, settled down on a ranch and fell in love with a cowboy. The love didn’t last long, and when 10 years passed, brave Fran has bought a cafe with intention to make it over into an antique shop. However, the locals convinced her to continue the tradition and thus elegant Fran started to roast hamburgers. 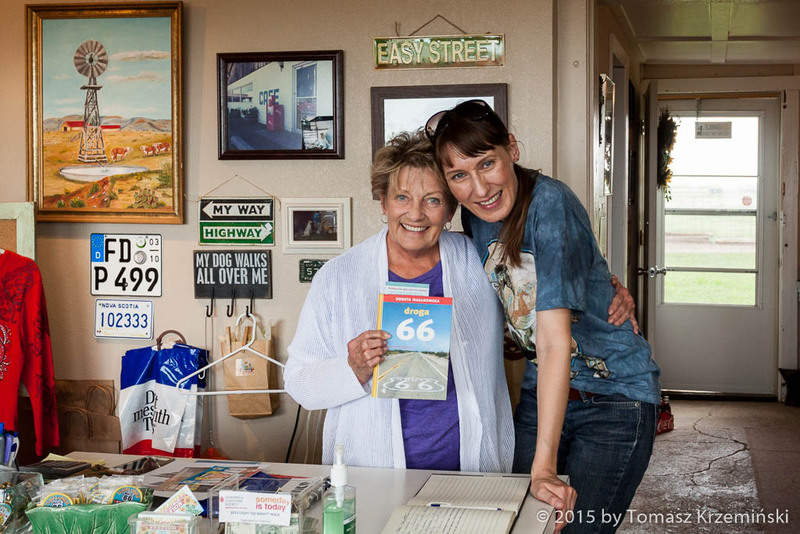 But finally she made her dream come true by selling MidPoint Cafe to Dennis and opening this lovely Sunflower Station. 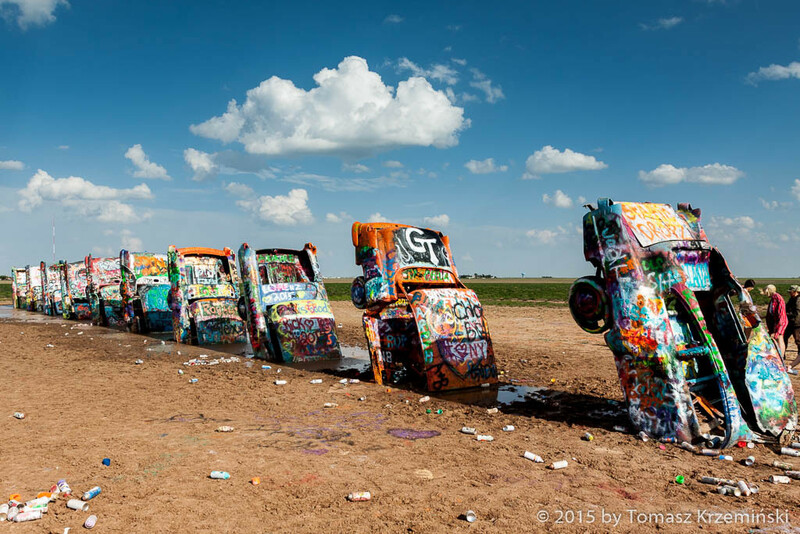 Cadillac Ranch in Amarillo TX – ten cars stuck into the ground, set up in westerly direction, on a field close by Route 66. Free admission through an old gate, as you were entering some paddock. It’s unusual tourist attraction, where everyone can paint with spray each of the Cadillacs in any color and pattern he chooses to. The art is created here in front of your very eyes or you create it yourself. The Ranch was installed in 1974. The artists-hippies of the Ant Farm group hit on this idea. They bought cars from local farmers and arranged them in order from the oldest a 1949 model to the latest a 1963 model. The sponsor of this idea was an eccentric millionaire Stanley Marsh 3, let’s call him a patron of the arts, although that art is a little crazy. But who says it must be serious?! 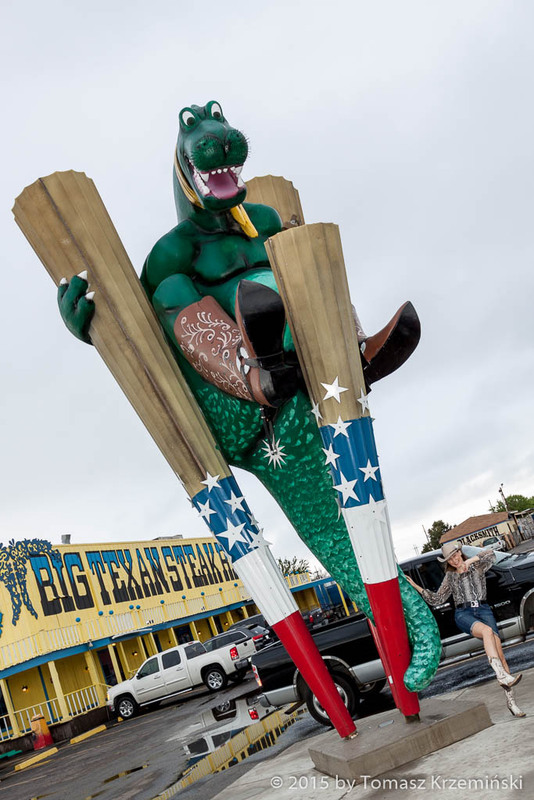 Big Texan Steak Ranch in Amarillo TX is absolutely one of the most fantastic places on Route 66! With respect to the number of attractions it‘s comparable only with Las Vegas. This is the essence of cowboy’s Texas. Let’s start the tour: first was restaurant opened in 1960 by R. J. “Bob” Lee the father of current owners. Located on Route 66 at the beginning, then moved to the area close by I-40, which took over the road traffic. The big hall in Western style with long benches in the centre and booths aside. 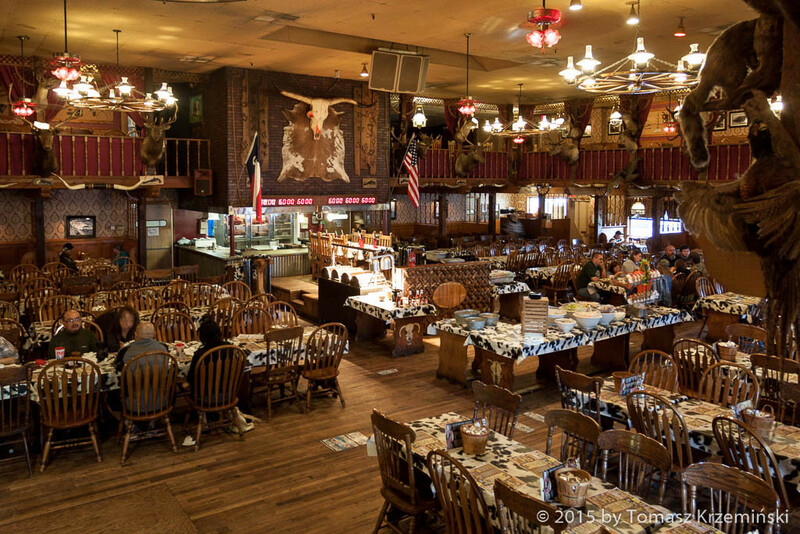 Among hubbub of the guests and country music waiters and waitresses, dressed in cowboy’s clothes, bustle around the tables. 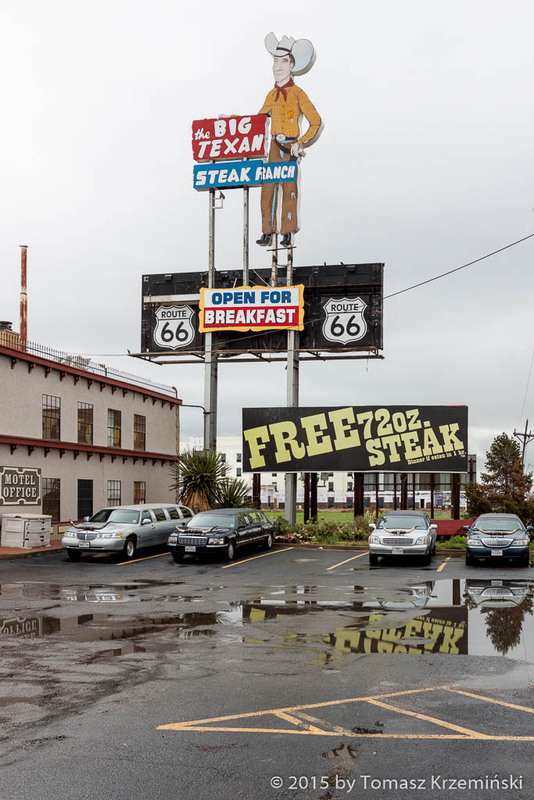 On one side there’s an open kitchen and in front of it there’s a big table with six chairs, which is set for the daring who will take up a challenge to eat 72oz steak meal (it’s 2 kg) plus sides in one hour (I must tell you – you won’t eat a better steak anywhere else). You can feel these emotions when someone decides to try it – the clock over the table counts the time and the guests of the restaurant encourage “the glutton”. When he achieves it, he gets the whole meal for free. There are people who did it, for instance a young lady who in April 2015 has eaten three steaks in 20 minutes time! ...and on your way for a dance you will find the gallery of “scary” photos – when you walk the corridor you see only ordinary people on the old photos, but when you passed them by these people change to a horror movie characters... brrr... Excellent! 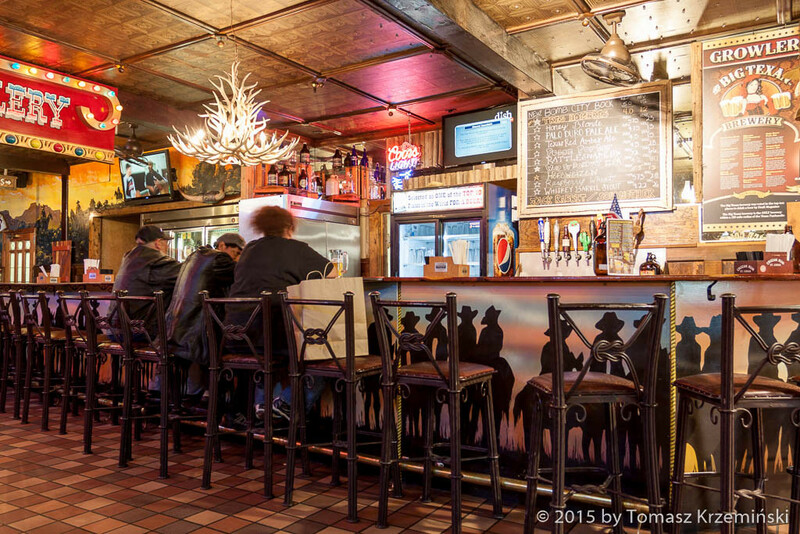 To recover you should spend some time in the cowboy bar. 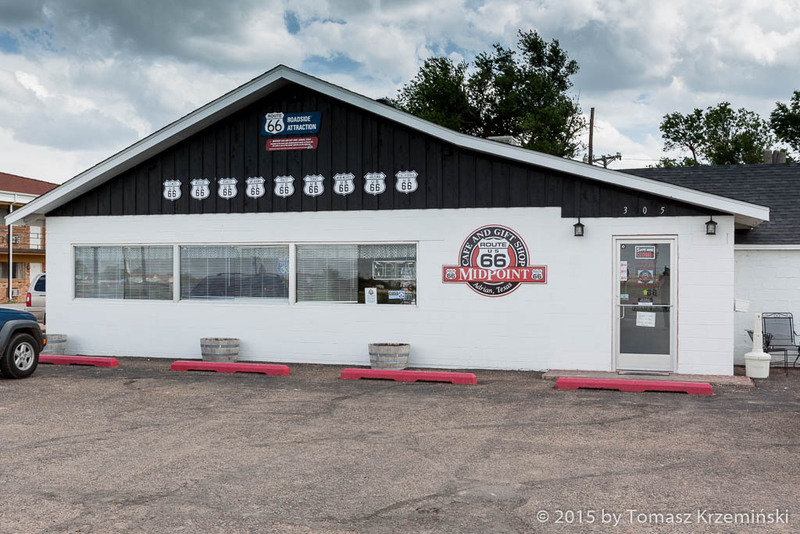 The owners – Bobby and Danny established their own brewery. You can choose from among different kinds of beers here. The restaurant is open from 7:00 am till 10:30 pm, but you don’t have to go far to find an accommodation. 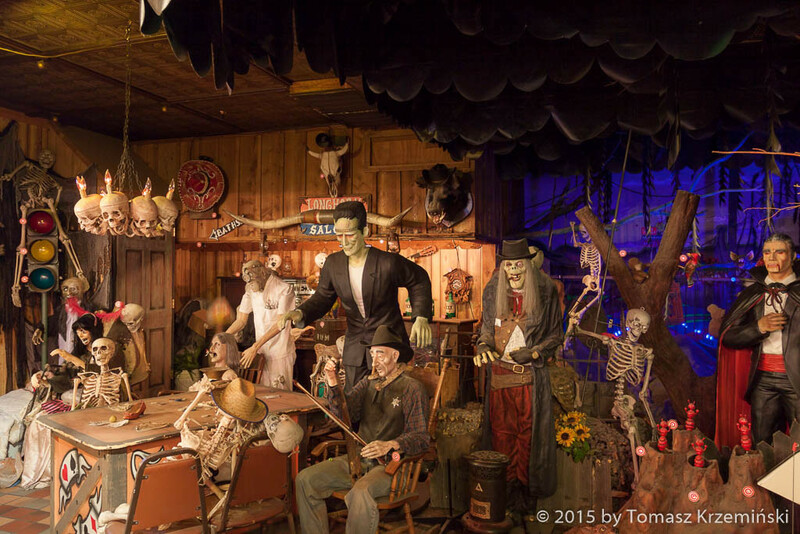 There’s a motel on the spot – buildings just like in some Wild West town, with incredibly beautiful interior of a main reception. 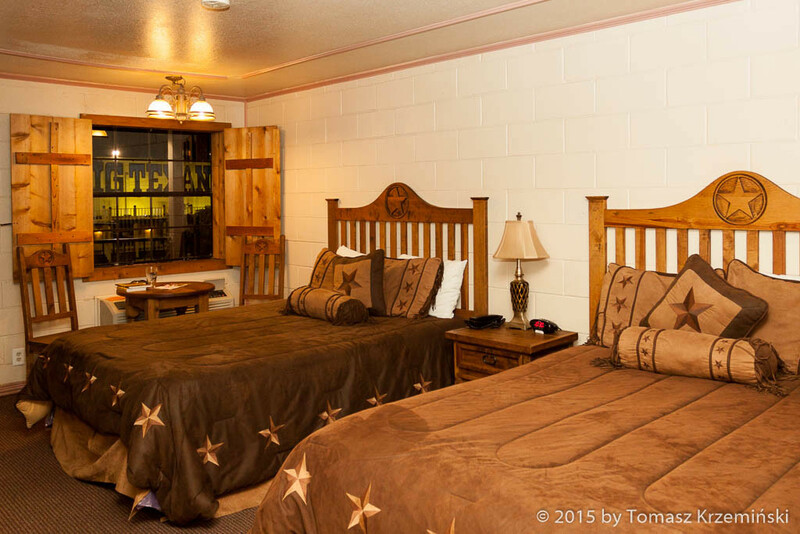 But the room will impress you even more – everything in brown color, heavy furniture made of wood, big beds covered with suede bedspreads and pillows, decorated with fringe and Texan stars, windows with wooden shutter. Even in the bathroom there’s wood and fringe at shower curtain. Am I already in the cowboy’s heaven? 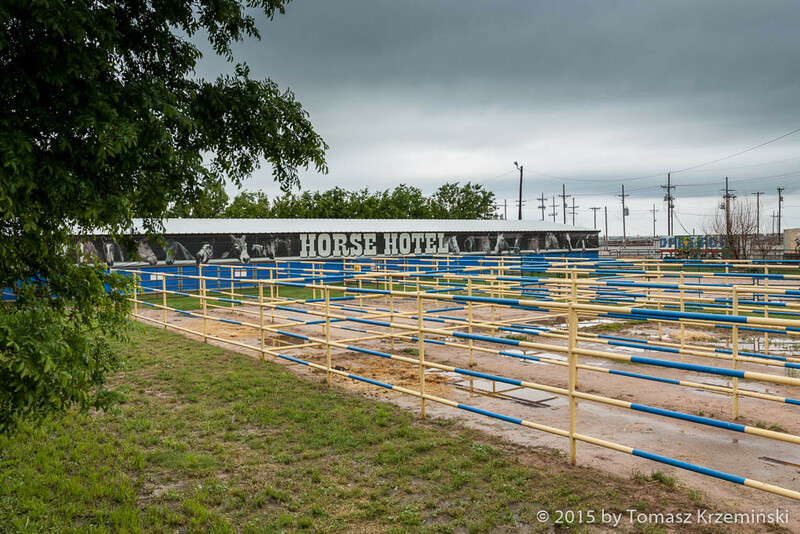 I guess so, because when you come with horses on your truck, you can place them in... the horse hotel(!). They will take care of your animals, while you can take your time in the restaurant, with a clear conscience. 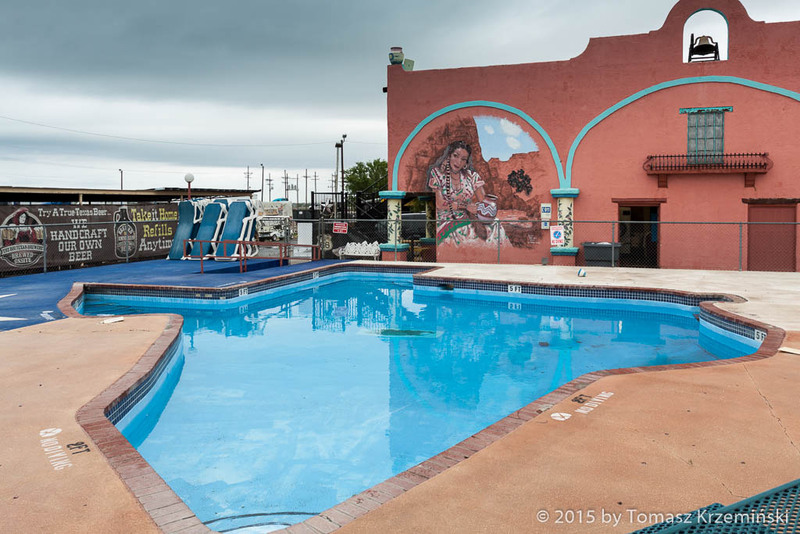 To refresh yourself during the day, after the evening full of fun, you have the possibility to swim in an outdoor swimming pool in the shape of... Texas state! 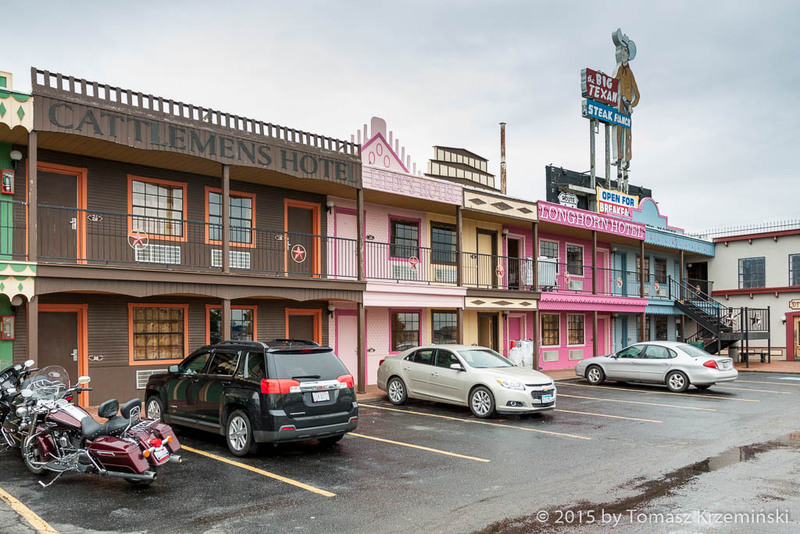 If you don’t sleep in Bobby’s and Danny’s motel you always can call for a limo, which has a buffalo horn on the hood. 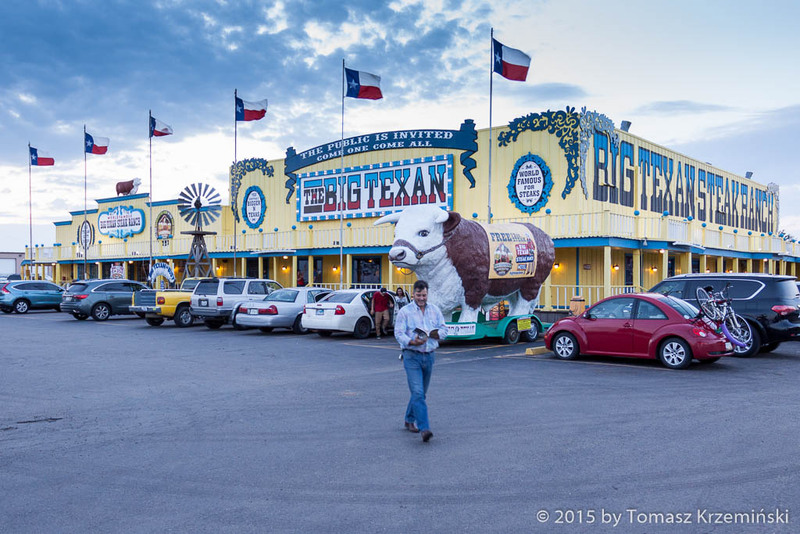 It will pick you up and your friends wherever you stay in Amarillo. Then it will take you back, all for free. 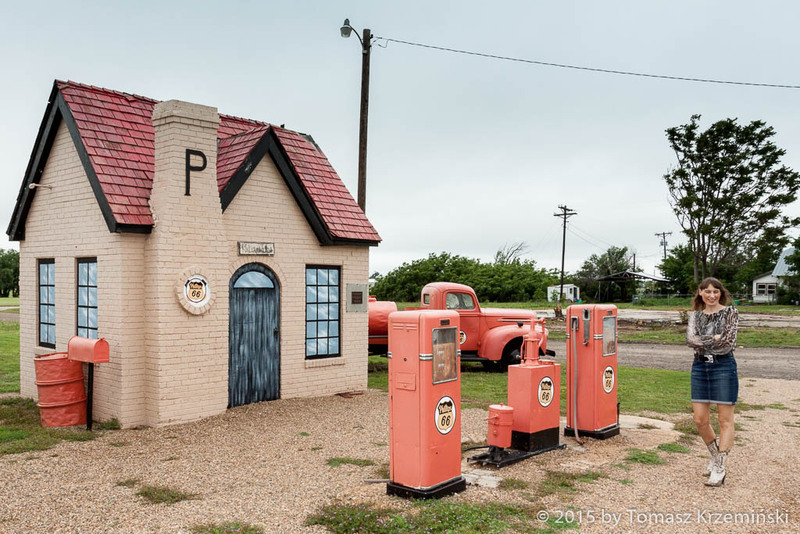 Phillips 66 in McLean TX is a mini gas station. It was built in 1929 as a first gas station of Phillips 66 in Texas state. 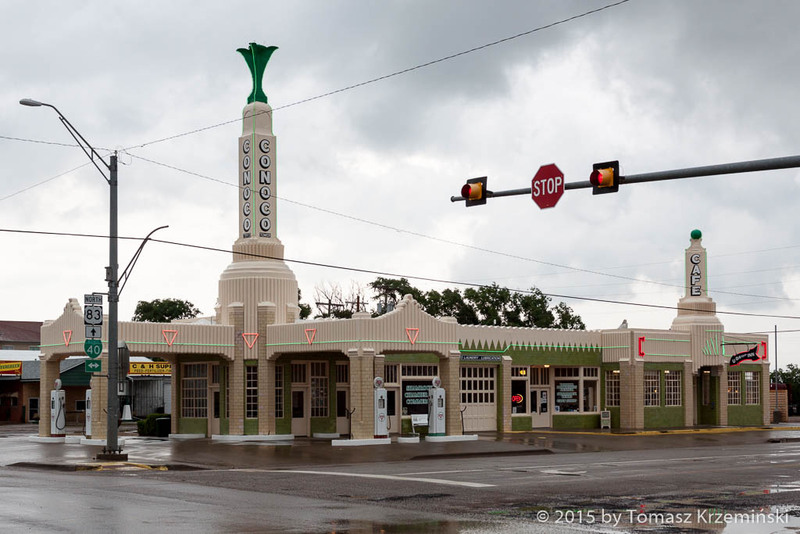 And this is the first renovated gas station on Route 66. 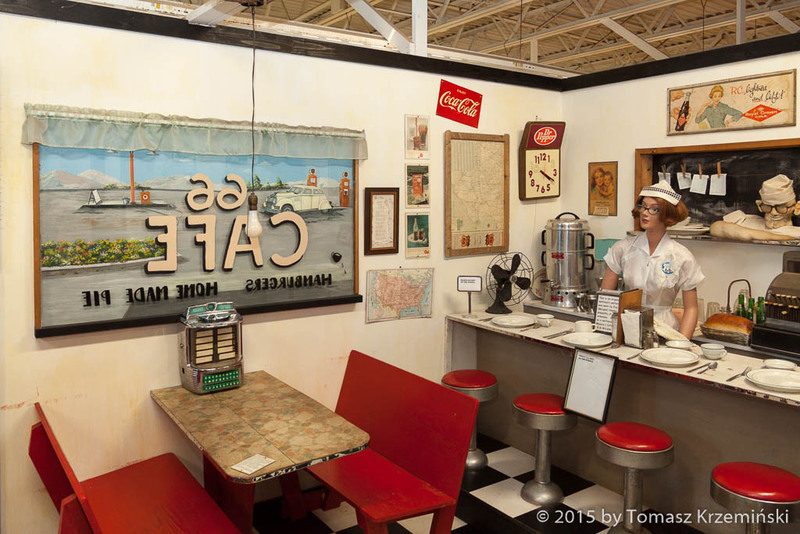 Devil’s Rope and Route 66 Museum in McLean. 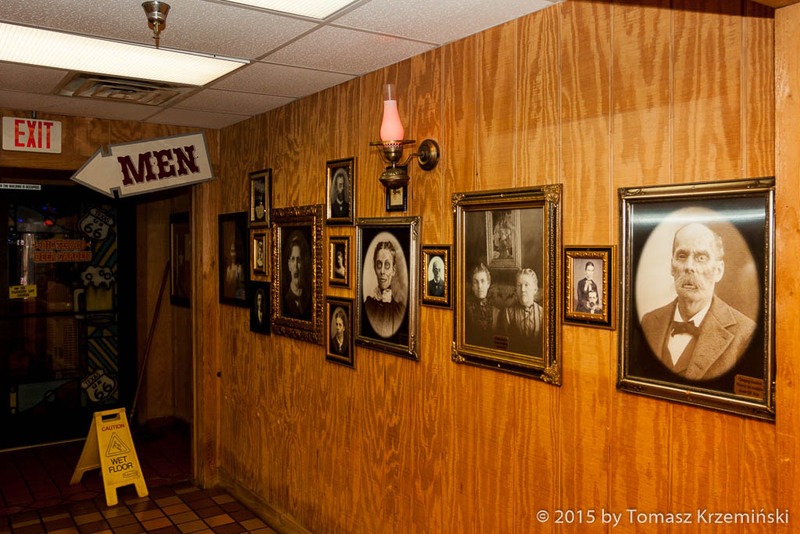 At first glance you may think: what a weird place, it’s enough to look on the name. 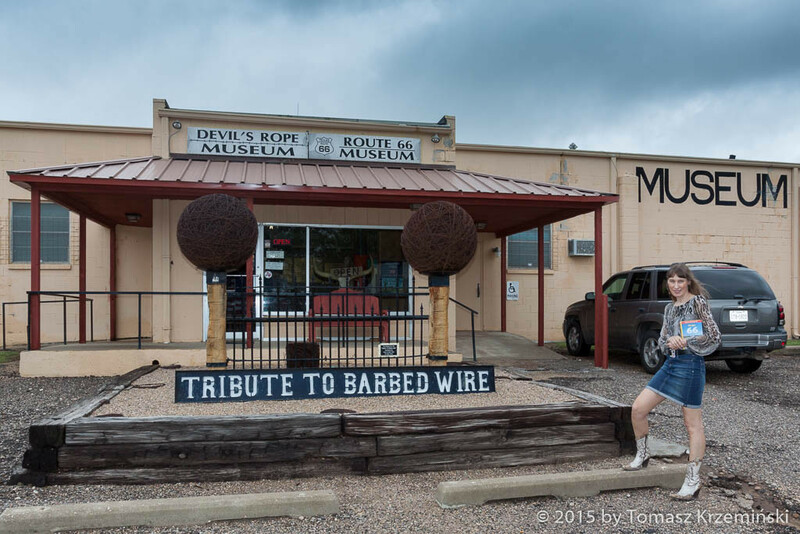 But from the very doorway, it turns out that barbed wire (which was invented by Frenchman, but patented by an American, in the 19th century) caused a revolution in way of thinking, and then in action, in Texas and in the neighborhood. A demand has grown fast, as soon as landowners got to know the advantages of barbed wire – it was cheap and very useful as a fence for a big property and kept the cattle in limited area. 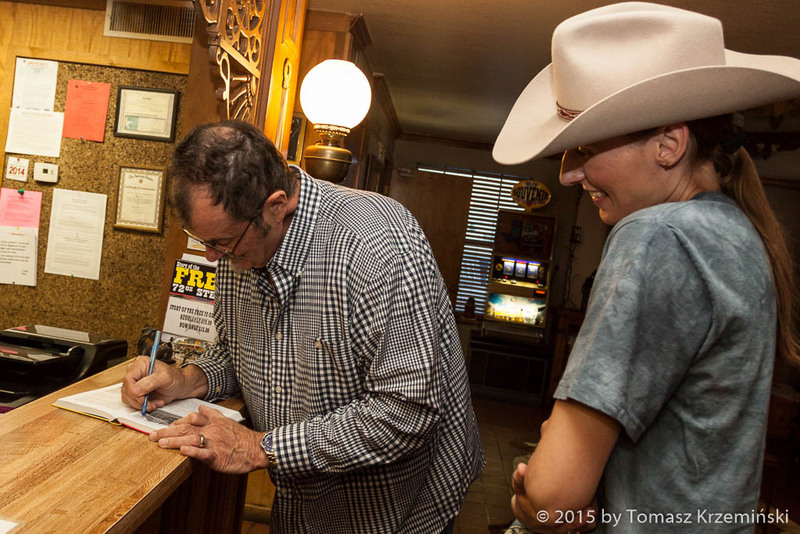 You need to know that, especially here in Texas, the private property of estate has a great value in people’s minds. You can see in the museum at how many occasions you can use the barbed wire, how many kinds of the barbed wire you can have and how many works of art can be made of it. Even though it was called the devil’s rope at the beginning. Cowboys used to call it like this – the one who were used to free pasturing of livestock and also fervent religious believers who considered it as a devil invention because it hurt cattle which had come to close to it. But animals have its own instinct and soon this argument failed. They started to use the wire on a mass scale. 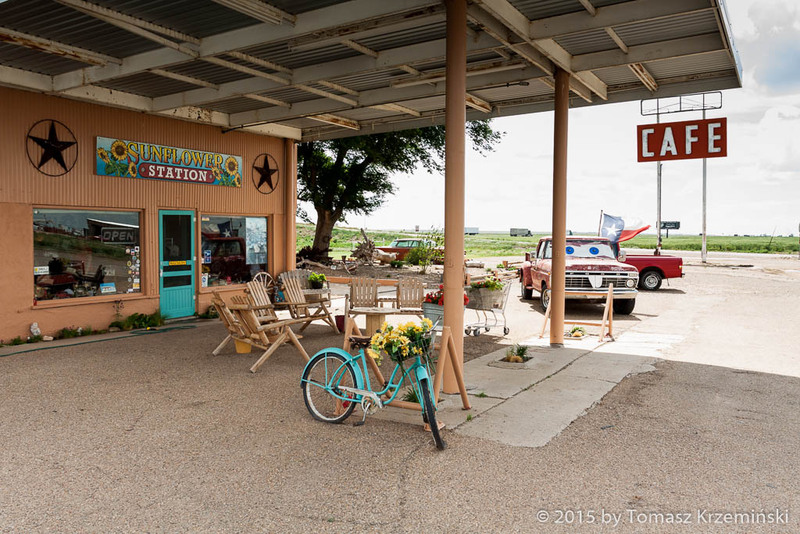 U-Drop Inn service station and cafe in Shamrock TX – it used to be a gas station and restaurant, now it’s a tourist’s information centre. Historical building in Art Deco style was built in 1936 and has been put on a list of vintage buildings. 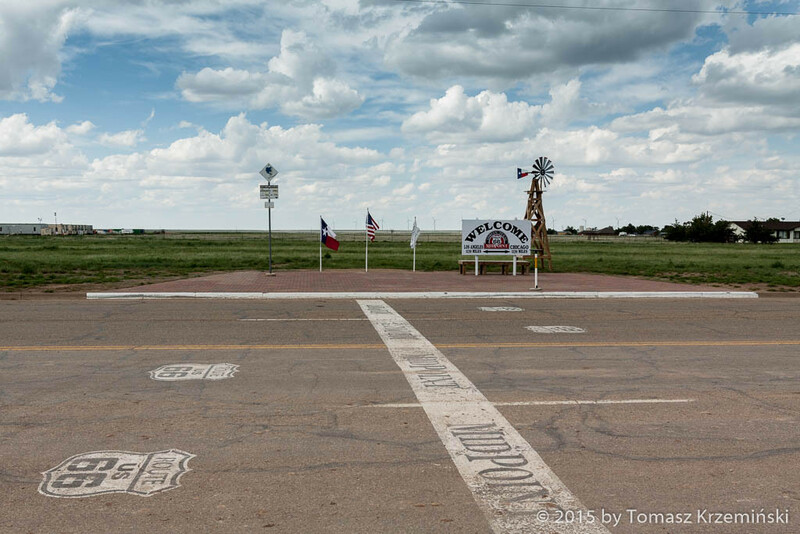 Length of Route 66 in Texas is ca. 186 miles (ca. 299 km).